Charles Paxton will be giving a talk entitled "The Vital Statistics of the Loch Ness Monster" on the 17th August at 8:30pm as part of "Skeptics on the Fringe 2012". However, I suspect the talk will not be as sceptical as we may think. Anyway, if you can make it, head along to support Charles in his latest analysis of Nessie sightings. I hope to be there myself. Paul Cropper (hunter of the Australian version of the Bigfoot called the Yowie) sent me a scan of this article from the Salt Lake Tribune of January 14th 1934. Though the image suggests a bit of tongue in cheek it is worth a read and shows how much interest the new subject of the Loch Ness Monster was generating even afar as the state of Utah in the USA. The catalyst for this article was probably the Hugh Gray photograph which had appeared a few weeks before. Note the early emphasis on the view that the creature was a sea serpent that somehow found its way into the loch. That notion eventually gave way to the dominant theory that the creature had somehow got into the loch much earlier, perhaps thousands of years earlier. I have no opinion myself on when Nessie first took up residence in Loch Ness but certainly prior to Saint Columba which was over 14 centuries ago. The document can be viewed here. I must admit I like their rendition of Nessie attacking some bekilted Scots amidst a loch full of empty(?) whisky bottles! Having spent a week camping in the Kingdom of Fife, I come home to a new alleged photograph of the Loch Ness Monster. 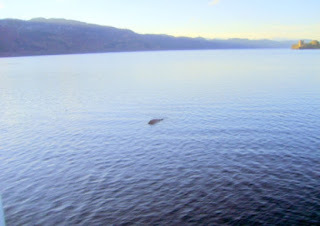 It would therefore be remiss of me not to comment on this latest image, not just to add it to the blog's history of Loch Ness and its unfathomable inhabitant but also attempt to wade through what is being said about it. This is the account from the Daily Mail. He has dedicated more than two decades of his life to the hunt for the elusive Loch Ness monster, spending 60 hours a week on the water. And now George Edwards believes he has finally fulfilled his ambition of spotting 'Nessie'; he even photographic evidence to prove it. Mr Edwards, who has spent 26 years on his quest, managed to capture this image of a dark hump slinking in and out of the lake's waters from the deck of his boat, Nessie Hunter, before it vanished back into the deep. 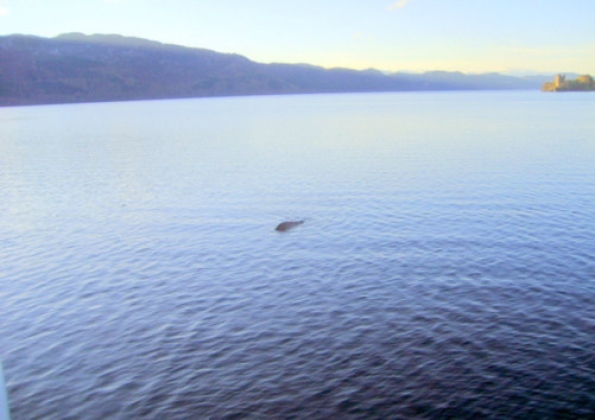 He claims the picture is the best-ever taken of the Loch Ness Monster and proves once and for all that the elusive leviathan exists - and is definitely not a sturgeon. He says he has even had it independently verified by a team of US military monster experts as well as a Nessie sighting specialist. Mr Edwards spends his life on the loch - around 60 hours a week - taking tourists out on his boat Nessie Hunter IV, and has led numerous Nessie hunts over the years. Steve Feltham, who has dedicated the past 21 years to hunting for Nessie was unequivocval. 'It is the best photograph I think I have ever seen,' he said. 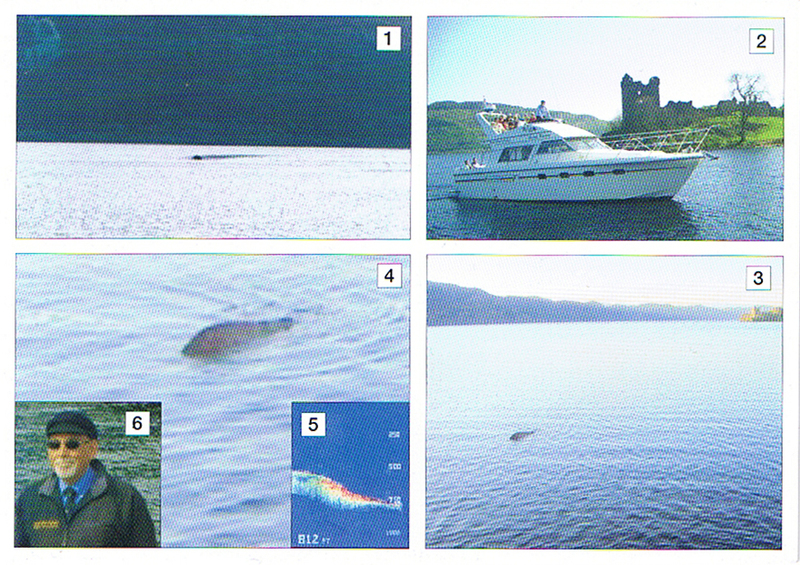 From his base on Dores beach and has studied many Nessie sighting photographs. I actually was informed of this photograph by a local man back in May when the photograph appeared on a postcard sold by George Edwards from around Easter which is shown below and tells us a bit about George's Nessie hunting history. The pictures marked 3 and 4 are the one of interest whilst picture 2 is of the cruiser boat that George Edwards (in picture 6) employs in his tourist trade. Picture 5 reminds us of George Edward's other claim to fame which was the alleged 1989 "Edward's Deep" which he claimed registered a record depth of 812ft in Loch Ness (as opposed to the accepted 754ft). This reading is disputed and has not been officially recognised. Picture 1 is of another image allegedly of Nessie in its single hump aspect taken by George Edwards on the 6th June 1986 at about 7am to which we shall return. Some years prior to all this, George had been working on a Nessie book called "In Search of Eioch Uisge (The Water Horse)" which had been mooted for publication in the late 1990s but so far only extracts of it have surfaced on the Internet. This is a pity as it would have offered some insight into a person who has claimed to have seen the creature up to 19 times. Three claims against the pictures are made. The first that the sun could not be that high at 9am on the 2nd November. The second is that the object is much closer than the claimed "half mile" and the third asks why only one picture was taken if the object was visible for up to 10 minutes. On the first point, the shadow on the enlargement below does suggest to me that the sun is on the opposite side to the south east though on that day the sun does not rise until 0720. A look at the picture shows that the castle's north west side is darker than the rest which is supportive of this idea. It is not readily apparent from the picture whether the sun is low in the sky or this is just cloud reflection. The sun position on that day and time are shown below. From the red marker showing the probable site of the incident, the green line points to sunrise, the yellow to where the sun is at 9am and the red line is sunset. On the second point, it has to be admitted that the object is not half a mile away. In the top picture, you can see Urquhart Castle which is about one mile away from the stated position at Temple Pier. To the bottom left of the picture you can see an object which is undoubtedly part of the boat he is on. Based on that, I would guess the object is much, much closer. However, George Edwards is rather non-committal on the distance which given the alleged analysis by military experts is rather disappointing. They said the picture shows an animate object (though no wake is unambiguously visible) which leads me to ask George if I could see a copy of their analysis. But there is actually a concentric ripple around the object which can help estimate distance. It is just about visible on the outer edges of the zoom in above. As you may know, a circular ripple seen at an angle can appear elliptical. The "flatness" of the ellipse can allow the angle of observation to be calculated and if the height of the observer above the water is known, then so can the distance to the object. The ellipse has a ratio of about 12:34 (0.35) which suggests an angle of observation of about 31 degrees. If the observer is standing 3 metres above the water then a bit of trigonometry gives a distance of 5 metres (another study emailed to me suggests 13 metres). Witnesses being accused of being vague or wrong about dates, times and distances is part and parcel of media reporting of theses stories and I personally regard them as of secondary importance. I say that after recent experiences of newspapers getting some facts wrong. It always seemed strange to me that a witness would lie about such things. What is to be gained from such a stance especially as George Edwards himself is well aware of the depth of questioning that is applied to modern photographs purporting to be of Nessie. The third point about why further photographs were not taken may seem an irrelevance but the context for asking such a question is the idea of motion. If the object was indeed moving slowly towards the castle, then a sequence of pictures would not only show this but reinforce the case for the images being genuine (as a sequence is harder to fake). If one were a sceptic, the case may seem closed at this point, but I would like to hear Mr. Edwards address these points before making further comment. "Passengers on George Edwards Cruise boat "Nessie Hunter" will also be familiar with the photograph he took in 1986, now available for sale on the boat for 50 pence. I remember him telling me at the time how hard it had been to drag the water filled tube out of the back of a van and down to the water before it was towed out into the loch!" If that is true then Mr. Edwards is in serious trouble. However, as with the scutter about distance, time and number of photos, I invite George to exercise his right of reply before the matter is settled. But if we lay these things aside and approach the picture from the opposite direction, what can we further say? The first thing is that the object appears rather flat along its presumed spine. What this would indicate I could not tell. There is a general reddish brown colour to the object but with a darker ridge running along the top. The general shape in my opinion is not suggestive of seals, deer or otters. The wave patterns around the object strike me as being interesting. There is a general pattern of waves washing in from the loch towards the photographer in a line roughly parallel to the horizontal axis of the picture. However, there is also some unique wave formations around the object. I mentioned earlier the just visible concentric ripples which is more suggestive of a stationary object bobbing up and down than an object moving towards the castle. But water is a complicated medium and the complexity of interpreting waves can get too much if multiple forces are acting on the water. Indeed, if this was a fake Nessie tethered by a buoy, I may have expected more concentric ripples reaching as far as the boat, but that is just speculation on my part. The bottom line is that this picture raises more questions than it answers and until Mr. Edwards helps out by answering some of my questions, then this picture needs to be treated with caution.